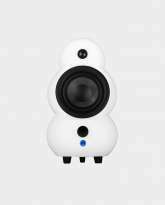 The vision of Simon Ghahary, the man behind Podspeakers – ‘Shaping Sound’ – became representative of his desire to create a new, unique design where form follows function to transform and optimise the audio experience compared to traditional speaker design. The sculptural curves are testament to an experimental and imaginative take on design, a desire to break with tradition and create something new in the fields of aesthetics and audio. Regardless of their shape, the sublime sound quality and stylish design of your Podspeakers stimulate all your senses, bringing music to life. They help create atmospheric rooms that inspire and give joy. This makes Podspeakers objects of attachment and synonymous with personal choice, just as Simon Ghahary intended. The opportunity to collaborate with Bowers & Wilkins Loudspeaker Ltd. arose against the background of the budding UK club scene of the 1980s and the electronic tendencies of that time. In 1991 the first Podspeaker prototype was created using salvaged loudspeaker components. This paved the way for a new, revolutionary way of designing speakers that has given Simon Ghahary cult status.